Peach powdery mildew caused by the fungus Podosphaera sp. Powdery mildews rank among the most important diseases of food and ornamental plants. Damage can result from death of host tissue (even entire plants), defoliation, cosmetic damage, reduced yields, and lowered quality. The economic and esthetic value of ornamental as well as fruit- and vegetable-bearing species are reduced by the unsightly appearance of powdery mildews. Powdery mildews also can cause losses in yield and quality by enabling decay organisms to enter fruits through damaged epidermal tissue. For some crops, such as wine grapes and cherries, controlling powdery mildews determines how the crop is grown (including such practices as pruning and managing soil fertility). Fortunately, effective cultural and chemical control practices are available for nearly every plant species susceptible to powdery mildew. Knowledge of the life cycle of a powdery mildew fungus can provide important clues to epidemiology and disease control. A complete life cycle includes both asexual and sexual reproduction. The asexual state produces conidia (asexual spores). The sexual state includes the ascocarps (variously termed perithecia, cleistothecia, and chasmothecia) that contain asci with ascospores. When both states occur, ascocarps usually are important in perennation (survival in the absence of a live host) and disease establishment, whereas the conidial state serves to spread and intensify the disease. Powdery mildews produce conidia in enormous numbers during the growing season, typically within 3–7 days after infecting the host under disease-conducive conditions. The rapid rate of asexual reproduction can lead to exponential growth of powdery mildew populations resulting in epidemics. Sexual reproduction of powdery mildew often is initiated in many plant species after flowering or late in the growing season. Ascocarps are resistant to low temperatures and drought, which enables the ascospores they contain to survive harsh conditions. Genetic recombination resulting from sexual reproduction can produce new genotypes resistant to fungicides or that display greater virulence than parental genotypes. Ascocarps also can initiate new epidemics (typically in the spring following the growing season during which they were formed) when, following a rainstorm or irrigation event, they discharge ascospores. Ascospores that land on susceptible and unprotected host tissue can establish primary infections to initiate the epidemic. Powdery mildews also can survive winter in the form of dormant mycelium within buds of infected plants. In regions with mild winters, such as parts of the Pacific Northwest west of the Cascade Range, sexual states do not seem to occur as frequently, or to be as important in over-wintering, as in areas that are inland.5 For non-deciduous plants in regions with mild climates powdery mildews can persist as mycelium on infected host tissue through the winter. Classification and identification of species of Erysiphales is difficult. Current estimates suggest that there are nearly 700 species of powdery mildews, classified in about 15 genera and occurring on 7600 species of Angiosperms. No Gymnosperms are known to be hosts. Recent research in the Pacific Northwest has determined that 150 or more species occur in the region. Many of the scientific names traditionally used to designate powdery mildew have been shown to have been used to designate superficially similar but distinct organisms.2, 3, 4 For example, “species” such as Erysiphe cichoracearum, Erysiphe polygoni, and Microsphaera penicillata each represent about 10–20 different species recognized in modern taxonomic systems. The most conspicuous feature of powdery mildew diseases usually is the appearance of mycelia and conidia formed on infected host tissue. Fungal colonies expand to form whitish, circular patches on the host that can develop a powdery appearance when large numbers of conidia are produced. Colonies may eventually coalesce and cover large areas of affected plant organs. As mycelia age they often become gray or brown and may cover the entire surface of leaves and stems. Affected host tissue frequently is stunted, distorted, discolored and (in the case of affected fruit) scarred or russetted. Sometimes, particularly late in the season, ascocarps can be seen with a hand lens or the naked eye. Ascocarps usually are 0.1–0.3 mm in diameter, nearly spherical, and, as they age, turn from yellow to dark brown or black. Depending on the host plant, pathogen, and local climatic conditions, in the spring the primary inoculum may be present in the form of mycelium on infected tissue, mycelium within buds, or ascospores contained within ascocarps. Pathogen populations begin increasing during the growing season when ascospores infect host tissue or when mycelia begin growing actively. In both cases conidia are soon produced and disperse to new host tissue to initiate new infections. Under conducive temperature and moisture conditions, the infection cycle can take as little as three days to repeat, resulting in rapid increase in the pathogen population and development of epidemics. When ascocarps are the primary means of perennation, primary infections typically take place after free moisture triggers ascospore discharge. Disease forecasting models take advantage of this fact by using the date and amount of precipitation to determine when to recommend fungicide applications. Unlike most fungi, powdery mildew spores do not require free water for germination. Spore germination is enhanced under elevated relative humidity. This adaptation renders management of powdery mildews especially challenging in glasshouses and irrigated fields where relative humidities within canopies can be high enough to promote infection. When perennation occurs within infected apple or hop buds, shortly after bud-break infected shoots covered with white conidia will be relatively obvious. These infected shoots (termed flag-shoots), are point sources of primary inoculum that will initiate epidemics. The frequency of flag shoots within apple orchards is inversely proportional to the severity to the previous winter—i.e., severe powdery mildew epidemics are more likely after mild winters than severe ones. The effect of low temperatures on the survival of hop powdery mildew is unclear. Host ranges vary significantly among different species of Erysiphales. Some species are restricted to one host family or genus, while other species appear able to infect a wide range of hosts in many families. Knowledge of the host range of a particular powdery mildew fungus is essential to controlling a plant disease because alternative hosts can serve as a source of inoculum. Host-fungus indexes can be helpful sources of information about the likely host range for a particular powdery mildew fungus. The severity of powdery mildew infestations are a function of host susceptibility, cultural practices, inoculum levels, and weather conditions throughout the growing season. Powdery mildew can be severe on both sides of the Cascade Range. In general summer weather conditions west of the mountains are more conducive to powdery mildews, but epidemics can be particularly severe east of the mountains as a result of cool, wet spring weather or excessive irrigation. The hot weather that characterizes the summer climate east of the mountain usually is not conducive to powdery mildews. The use of healthy planting stock can delay or prevent development of damaging epidemics. In some situations (such as encountered by homeowners growing susceptible cultivars of roses or other species) reasonably effective control can be attained by removing and burying or otherwise destroying infected plant tissue. This approach demands constant, vigilant attention and aggressive action and generally will not be economically feasible in commercial production systems. 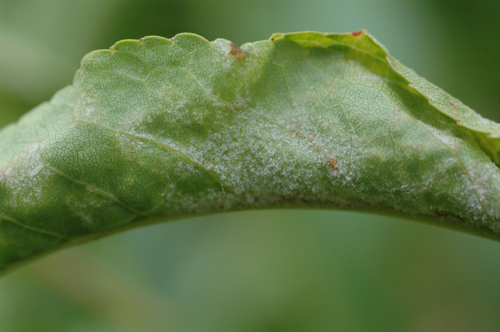 In landscapes, experience generally will enable a grower to learn whether a particular area in a yard or garden is conducive to powdery mildew diseases. For example, the higher relative humidity of shady areas often favors powdery mildew infections. In such situations an effective control strategy could be to plant only resistant species or cultivars. In some commercially-grown crops, such as grapes and cherries, pruning, plant spacing, and managing irrigation in order to avoid dense canopies can be effective in reducing humidity to prevent infection. Pruning for enhanced light penetration is also utilized in perennial crops. In areas conducive to epidemic development, growing resistant plant species or cultivars may be an effective strategy for controlling the disease. Resistant cultivars might not be an option for all crops, for example when a grower specializes in a particular apple or grape cultivar. In recent years several commercially available preparations of mycoparasitic fungi (fungi that parasitize fungi) and culture filtrates, derived from bacteria, have been labeled for use in controlling powdery mildews. As is the case for chemical control agents, users of biological control agents should carefully follow all label instructions. A variety of effective chemical controls are available for managing powdery mildew diseases. Users should be careful to follow label recommendations for the chemicals listed in this manual. Recommendations for fungicide use on some crops include information on disease monitoring systems and predictive models that can reduce fungicide use by ensuring that applications are made when they will be most effective. In general, the sulfur, petroleum-derived spray oils, sterol-biosynthesis inhibitors (DMI), quinone outside inhibitors (QoI), and quinoline fungicides are effective in powdery mildew management programs. Users should pay strict attention to resistance management guidelines. Utilize cultural practices to reduce pathogen populations whenever possible. For example, removal of overwintering infected terminals by dormant pruning helps reduce the primary inoculum level of apple powdery mildew. Delaying the initial irrigation of cherries early in the spring may help to delay the onset of powdery mildew epidemics. Limiting grapevine vigor reduces powdery mildew pressure in vineyards. Use (either as alternations or tank mixes) as many fungicide modes of action (classes) as possible in the disease management program. Use fungicides protectively before powdery mildew has become a problem. Do not use resistance-prone compounds to attempt to get a powdery mildew epidemic under control. Narrow range petroleum oils and carbonates are the best eradicative fungicides. Limit the number of applications of resistance-prone fungicide classes to no more than 3 per growing season. Adjust spray volume per acre based on the size and volume of the crop to attain excellent spray coverage. Apply fungicides at rates specified on the fungicide label (do not reduce rates). Avoid making more than 2 consecutive applications of DMI, quinoline, or strobilurin fungicides. Include low resistance risk compounds (sulfurs, carbonates, and petroleum spray oils) in the spray program as much and whenever possible. Apply fungicides during good conditions for spraying. 1 Bélanger, R.R., Bushnell, W.R., Dik, A.J., and Carver, T.L.W. 2002. The Powdery Mildews: A Comprehensive Treatise. APS Press. St. Paul. 2 Braun, U. 1987. A monograph of the Erysiphales (powdery mildews). Beih. Nova Hedwigia. 89: 1-700. 3 Braun, U. 1995. The Powdery Mildews (Erysiphales) of Europe. G. Fischer Verlag. Jena. 4 Braun, U., Cook, R.T.A., Inman, A.J., and Shin, H.D. 2002. The taxonomy of the powdery mildew fungi. Pp. 13-55 in Bélanger, R.R., Bushnell, W.R., Dik, A.J., and Carver, T.L.W. The Powdery Mildews: A Comprehensive Treatise. APS Press. St. Paul. 5 Glawe, D.A. 2004. Taxonomic diversity of Erysiphales (powdery mildew fungi) in the Pacific Northwest. Phytopathology: 94: S152. 6 Glawe, D.A. 2003. First report of powdery mildew of Mahonia aquifolium caused by Microsphaera berberidis (Erysiphe berberidis) in North America. Online. Plant Health Progress doi:10.1094/PHP-2003-0206-01-HN. 7 Jarvis, W.R., Gubler, W.G., and Grove, G.G. 2002. Epidemiology of powdery mildews in agricultural pathosystems. Pp 169-199 in Bélanger, R.R., Bushnell, W.R., Dik, A.J., and Carver, T.L.W. The Powdery Mildews: A Comprehensive Treatise. APS Press. St. Paul. 8 Yarwood, C. E. 1978. History and taxonomy of powdery mildews. Pp. 1-37 in Spencer, D.M. (ed.) The Powdery Mildews. Academic Press. London.